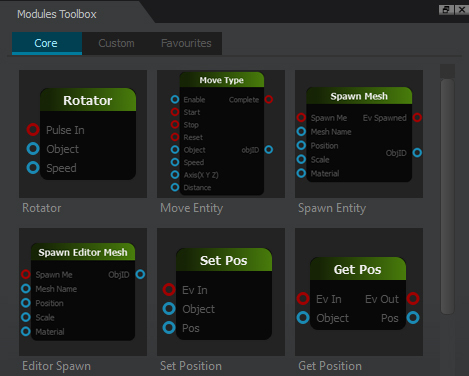 It's been a long time in development but we are happy to announce Skyline has had a major new addition to the mechanics scripting system in the form of the Visual Mechanics Editor ( Visual Modules ).to be released in the Skyline version 0.9.7 version. This new editor enables users with zero coding knowledge to be able to create dynamic scenes and games, not only is it not Scripting! its a fast and error free method with only a small learning curve. Once you understand the flow of the graph then it is possible for you to create almost anything by wiring a few blocks ( modules ) together. The system has been designed from the ground up to be a visual tools and as such all wires and modules are color coded for easy overview. 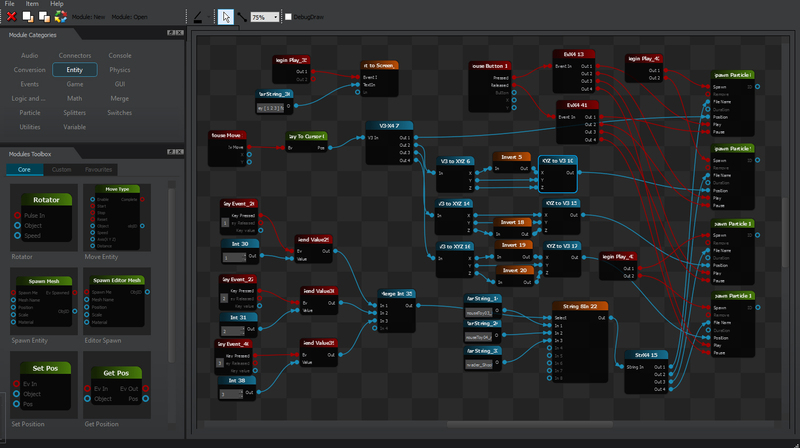 Access to this new power comes in the way of a scene graph which is designed to be used as a main game graph, basically the games overview. More detailed access comes in the shape of the new Micrograph action which can have a graph loaded from either a file or entity instance in a similar way to the Microscript action. Modules bring a lot of power to the table in the form of runtime speed as each module exists in C++ code space and as such runs as if the module was just part of the engine, this is the same as Skylines actions. Scripting languages such as Lua require some to'ing and fro'ing of data as any command needs to be read and sent to the engine (interpreted) and this takes up precious cpu cycles. Skylines new modules require no interpreting and run lightning fast ( or as fast as your PC will let them lol ). We have planned loads of new modules to be released over time and will happily add new user requested modules in future updates. Each module belongs to a library such as modules for Events or modules for variables ( ways to add numbers and text into the graph) There are many utility modules for use in various circumstances and specific game modules which are an all in one solution to various game mechanics. Want to create your own modules?, not a problem. By using the core modules you can have low level access to lots of Skylines C++ low level routines and place these into an empty module. Provide how ever many inputs and outputs your module requires and wire your cool new module up then save it to a user library for community sharing or re-use to save you on development time.